It wasn't too long ago that musicians said making music on your laptop will not be as great as your desktop computer. How things have changed these days, recording music on your laptop is a common thing to do. Now that iPad has taken the world by storm, can you turn your iPad to a recording studio? I have researched what would it take to turn your iPad into a portable recording studio? How should you set it up? 1. Auria (WaveMachine Labs) - This is the first app that supports the industry standard of 24 bit//96kHz. 2. StudioTrack (Sonoma Wire Works) - Multitrack Recording for iPad. Record up to eight tracks on a multitouch mixer with meters, faders and knobs. Control multiple parameters simultaneously, like an analog console. Rearrangable channels help you keep your tracks organized. 3. MultiTrack DAW (Harmonicdog) - It provides up to 24 stereo tracks of better than CD quality audio, and the ability to playback all of those tracks, while recording 2 tracks simultaneously on iPod or iPhone, and up to 8 tracks simultaneously on iPad. 4. GarageBand (Apple) - This is now made for the iPad. GarageBand lets you play a collection of highly expressive Touch and Smart Instruments that sound just like their real counterparts — but let you do things you never could on a real instrument. You can record, mix, and share your songs, too. 5. Portastudio (Tascam) - This brings 30 years of easy-to-use home recording to your iPad. Based on the PORTA ONE recorder that revolutionized recording in 1984, the Portastudio app records up to four tracks with a cool retro/vintage vibe. Record one track at a time using the built-in mic or a headset microphone connection, monitoring on authentic VU meters. A cassette transport with position counter tracks your position while you mix with level, pan and EQ controls. When you're ready to mix, the built-in mixdown function saves your song as a CD-quality WAV file. Your mix appears in iTunes when you're finished, ready to share with friends and bandmates. 1. Focusrite iTrack Solo - provides the great solution for recording your instruments and vocals using an iPad and is a certified ‘Made for iPad' device. 2. IK Multimedia iRig Pre - this is an universal microphone interface for iPhone/iPod touch/iPad! iRig PRE Microphone Interface iPhone/iPod touch/iPad is the ultimate solution for connecting any type of microphone from regular stage microphones to expensive studio models to any iPhone, iPod touch or iPad providing access to the widest range of recording applications. 3. TASCAM iXZ - a portable interface for recording with your Apple iOS device. It provides the inputs you need to record nearly any acoustic or electric instrument to any of the thousands of recording apps on the app store, including Apple's own Garage Band or TASCAM's Portastudio. 4. Alesis iO Mix - you can mix and record up to four channels of audio into your iPad. The Alesis iO Mix is the first device that turns your iPad into a powerful portable studio, allowing you to record multiple mics or instruments directly into GarageBand or any other compatible Core Audio app. 5. Alesis iO Dock - the first device that enables anyone with an iPad to create, produce, and perform music with virtually any pro audio gear or instruments. The iO Dock is a universal docking station specifically designed for the iPad, and it gives musicians, recording engineers, and music producers the connectivity they need to create and perform with iPad. Connect all your pro audio gear to virtually any app in the App Store with the iO Dock. iRig MIDI (IK Multimedia) - a pocket-sized MIDI interface lets you hook up your favorite keyboard, pad controller, DJ interface, etc. to your iOS device. 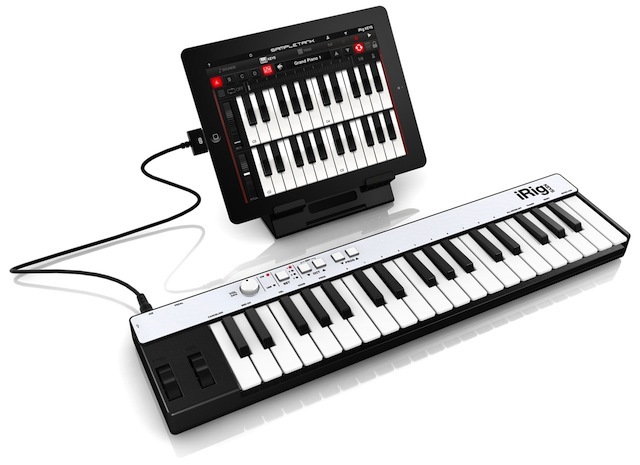 The iRigMIDI lets you run any of the amazing CoreMIDI-compliant iOS apps. iConnectMIDI (iConnectivity) - Own a MIDI-equipped keyboard controller, guitar, drum kit, or any piece of gear? You can now tap into the unlimited power of the App world! 2. GuitarJack Model 2 (Sonoma Wire Works)- The GuitarJack Model 2 iOS interface connects a wide range of instruments, microphones, and other audio hardware to the iPhone, iPad and iPod touch. 3. iRig STOMP (IK Multimedia) - first stompbox guitar interface for iPhone, iPod touch and iPad.